In the fight against Vermont Gas' proposed Addison County natural gas expansion, it's largely been landowners piping up with concerns about the project, which would run a natural gas transmission line south through Vergennes and Middlebury — and potentially on to Ticonderoga, N.Y. Until now. 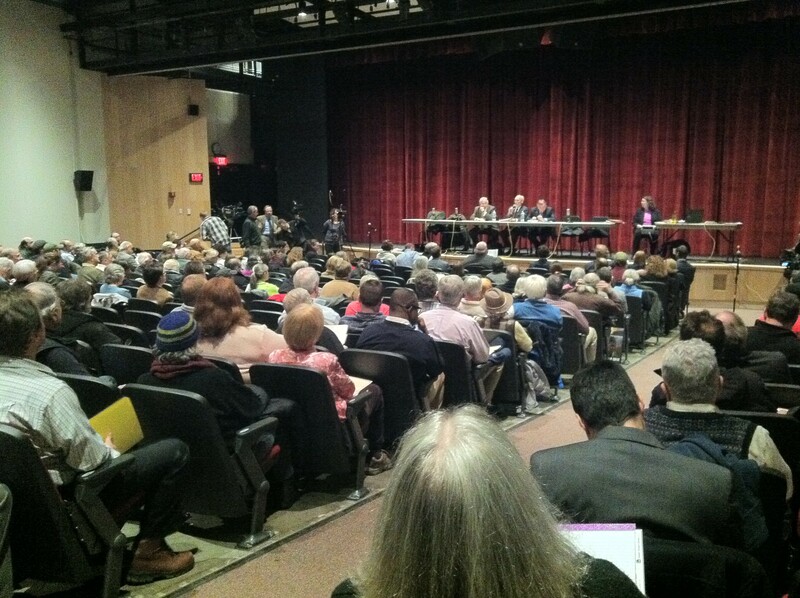 A rally last night at Champlain Valley Union High School illustrated that property owners aren't the only ones balking at the pipeline extension. A growing grassroots coalition of environmentalists and workers' rights advocates, singing solidarity songs and brandishing banners, gathered in front of the high school to make their objections known prior to the start of a Public Service Board public hearing on the project. 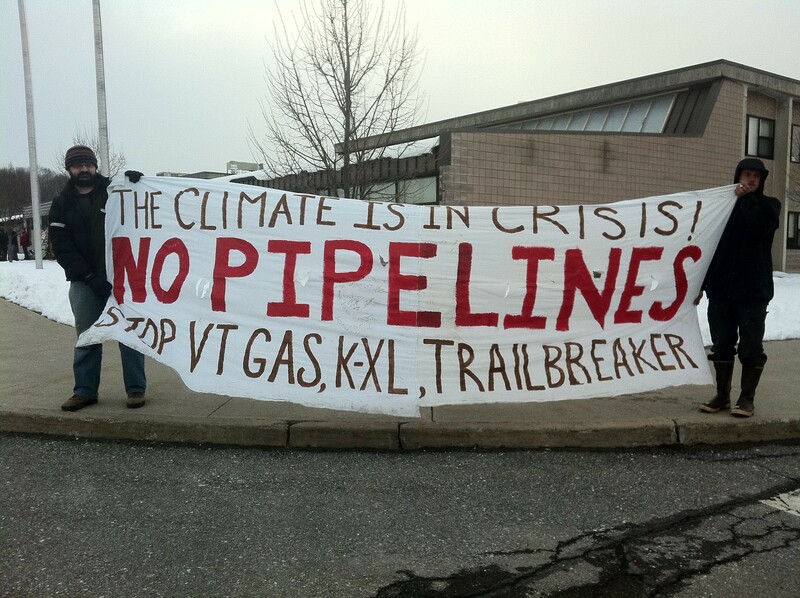 Chief among their concerns is the environmental impact of extending a pipeline that carries fossil fuel deeper into Vermont. In particular, the protestors are unhappy that the pipeline would carry a portion of gas obtained in Canada using hydraulic fracturing, commonly known as "fracking" — Vermont Gas concedes that this is the case. Vermont lawmakers last year passed a law making the Green Mountain State the first in the country to ban fracking. It's a technique oil and gas companies love, because it opens up vast reserves of shale gas previously too costly or difficult to extract. Environmentalists have long raised the alarm, however, pointing to problems with groundwater contamination, waste water disposal and even earthquakes in places where fracking is underway. "I am concerned about the hypocrisy of Vermont to on the one hand ban fracking and on the other use gas from somebody else's devastated landscape," said Rebecca Foster, a Charlotte resident who turned out for the rally and PSB hearing. More broadly speaking, the pipeline's opponents decried a potential decision to expand fossil fuel distribution and use in Vermont at a time when they'd prefer to see alternative solutions take the lead. Rising Tide Vermont organizer and volunteer Will Bennington said that investing in pipeline infrastructure could "lock" Vermont into fossil fuel use for decades to come — and could potentially remove the incentive to work more quickly toward alternative means of energy conservation and generation. "If all of the financial resources that were being put into this were being put into weatherizing every home in Addison County, that would be a huge win," said Bennington. 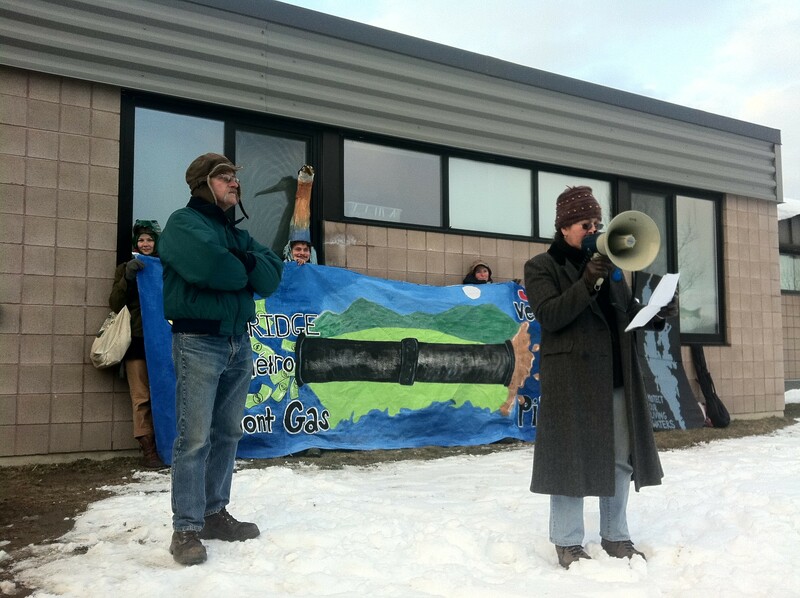 The message — that the pipeline is not just a landowners' issue — came through loud and clear during the brief rally, during which representatives from Rising Tide Vermont, 350 Vermont, and the Vermont Workers' Center spoke. Property owners along the proposed pipeline route also stepped forward to voice their concerns — among them, complaints that Vermont Gas is not willing to compensate landowners fairly for property easements along the route, and that the Gaz Metro-owned utility has acted in a manner unbecoming of a "good neighbor." Again, though, environmental concerns cropped up. "For me as a landowner, I feel pretty attached to my land," said Nate Palmer, a Monkton farmer who lives along the proposed route. "I feel sorry for everybody on the other end," he said, calling those who hook up to the gas pipeline "accomplices" in the environmental destruction that takes place to obtain natural gas. The PSB hearing that followed was an opportunity for members of the public to offer testimony on the project. So many individuals packed the CVUHS auditorium that the three-person board limited each speaker's comments to two minutes apiece — and still estimated that the hearing would stretch on for three hours. Early on, business advocates — including restaurateur Al Gobeille, who owns Breakwaters — spoke in favor of the pipeline, citing economic benefits. Gobeille said his natural gas bill last year was $29,000 — but that paying for a similar amount of propane would have cost $81,000. "As a small business guy trying to pay my bills, natural gas is my friend," said Gobeille. But after a handful of business leaders chimed in with similar support, Middlebury College student Sam Koplinka-Loehr stepped to the microphone. He told the PSB that though Middlebury's treasurer would be speaking later in the evening in support of the proect, Middlebury College students stood against a development that he said threatened water quality and went against the wishes of the community. In doing so, Koplinka-Loehr won the first showing of applause and support from the audience — and prompted a general warning from the board to keep applause and hollering in check. Still, much of audience seemed in agreement: A new pipeline? No, thanks. "It's a freakin' fossil fuel pipeline that's going to go under Lake Champlain," said Rising Tide's Bennington before the hearing. "It's a no brainer."